“Technology coaches demonstrate professional knowledge, skills and dispositions in content, pedagogical and technological areas as well as adult learning and leadership and are continuously deepening their knowledge and expertise” (ISTE 2011). a. Engage in continual learning to deepen content and pedagogical knowledge in technology integration and current and emerging technologies necessary to effectively implement the ISTE Standards•S and ISTE Standards•T. Technology coaches contribute to a technology-enhanced learning environment by “engaging in continual learning,” in order to “deepen their knowledge and expertise,” and bring emerging best practices in both “pedagogical and technological areas” to the school program (ISTE 2011). 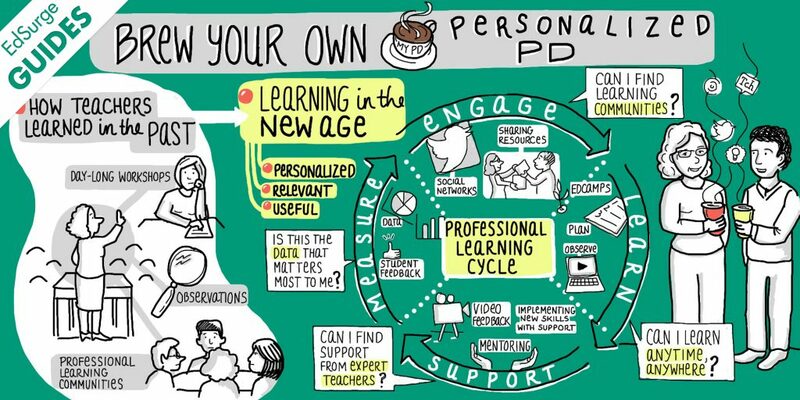 Over the years, I’ve become an expert at “brewing” my own personalized professional learning. As a connected educator, I have spent my career engaged in continual professional learning as an active member of professional organizations. I attend and host workshops at professional conferences (NCCE, NCTE, WLA, EdCamp, EdSurge) and distinguish myself as a professional learning leader (Common Sense Education Ambassador, Google Certified Educator, Microsoft Innovative Educator). I use digital communication and collaboration tools to maintain a rich professional learning network (PLN). These activities have allowed me to stay current with emerging best practices in both academic pedagogy and technology. During my coursework in the Seattle Pacific University Digital Education Leadership Master’s Degree program, I examined “content and pedagogical knowledge in technology integration and current and emerging technologies” through the lenses of the ISTE Standards for Students, Teachers, and Coaches (ISTE 2011). In the last quarter of the program, I reflected on my strengths and identified an area for growth: computer science. To build my knowledge and skills in this area, I am currently completing online computer science courses using the Treehouse platform. I enjoy and promote professional learning that meets each individual educator where they are in their learning journey, provides a choice of learning paths and methods, rewards positive outcomes, and dedicates time for reflection and future planning. International Society for Technology in Education (ISTE; 2011). Standards for Coaches.